Our work impacts children, care givers, artists and teachers directly and those who visit the shelter homes and sites of our work indirectly. In this section we bring you the voices and words of some of whom we have worked with. Thank you so much for inviting me to take a part in the charity. I never thought I'd be traipsing around Delhi with a broken toe in maddening heat - It's been a challenge but a very welcome one! 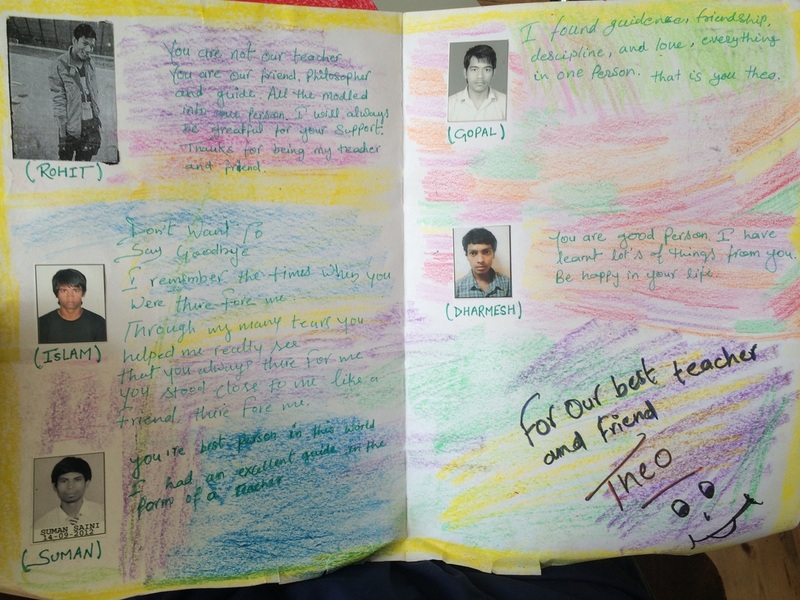 ​It was great fun to get to know the boys individually and to teach them but also to learn from them at the same time. I learnt about their lives before joining the trust, aspirations and outlooks on life all of which was fascinating and illuminated the amazing work the Salaam Baalak Trust does (as well as the latest gossip on famous Bollywood actors). I have a lot to thank the boys for. They were always keen to take an active roll in the painting project. 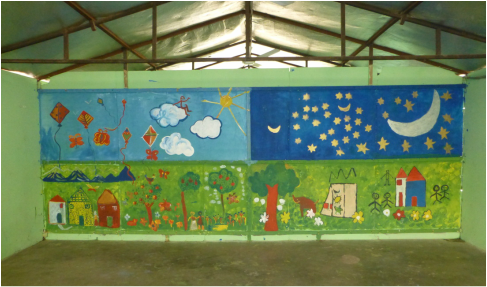 Painting with them was incredibly fun, I was apprehensive at first at the site of these huge bare walls but everything ended up nicely fitting into place and I was very pleased that the younger kids were happy with it too. ​I loved teaching the boys English; watching them improve was very rewarding and they showed great diligence during the lessons. I would love at some point to go back and visit the charity. In the meantime I'll be sure to let others to get in touch with you if they are interested in taking part in a project in Delhi. Nothing in life is more beautiful than colours, and colours that are spread by you on the wall of our home are even more beautiful because of the love and affection you have put in it. We, the people at Kilkari h﻿﻿ighly app﻿﻿reciate and admire your hard work and effort. It's only because of you th﻿﻿at our walls have become a piece of art in many ways. When ever we look at the walls decorated by you, our hearts fill with pride and honour and heads bow in respect for you and your hard work. Your presence at Kilkari gave our children a sea of opportunities to learn new things and look at things differently. You have inspired them to do things in their own ways. Nothing could have better than this. It was was an honour to have you with us. Let there be many more such opportunities in future. The children and teachers at the School wrote beautiful handwritten notes thanking the artists for their work! I absolutely loved the train we created for the BET school, the children who did it with us seemed to have needed no help at all and were wonderfully talented! Artreach is such a worthwhile charity so I was very pleased to be able to contribute to its success in a small way. It was so nice to draw and paint with such enthusiastic and talented children and I loved the final piece so much! It was all very well organised and there were ample supplies for the children to paint with. I thought in particular the brainstorming session on the first day with them drawing their favourite characters was particularly good, to show them they can paint whatever they want and art isn't just about instruction, but freedom to do what they like. It was really incredible seeing the kids engage with their work. When all the pencils and paints come out a hush would come over all the kids as they worked. There was a little seven year old who would just stare transfixed as her sketches materialized in front of her- her eyes would never leave the page such was her concentration. Being able to step back and look at the end result was amazing too- the mural really brightened up the room and I'm sure it will encourage all the kids to start rooting through all the books to look for the characters. Creative work outside the studio and university has always been exciting for me as it brings in so much of life in the process. Both days were filled to the brim with conversation and laughter, and somehow through it we ended up with a whole wall of art and many paintings on paper. 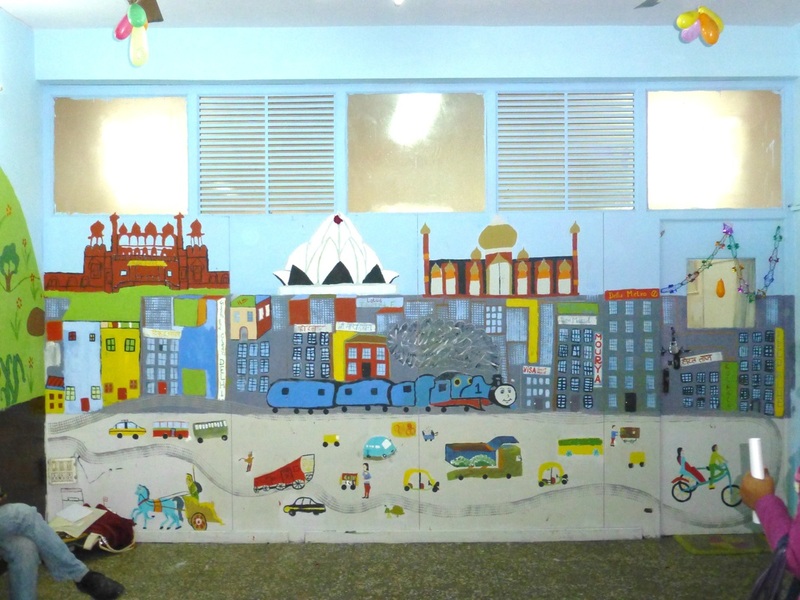 The mural at the Jama Masjid Shelter was a unique artistic experience as we collaborated with kids and women who have a life completely apart from ours with often no art, and yet with colour I felt we could connect beautifully! I found it inspiring to have the kids express themselves so well through drawing, with no training at all. I really enjoyed talking and hearing their stories through the work process as well. The children had a great time. In fact a lot of them have been coming up to me to paint again. It was indeed an experience for them to cherish. All Thanks to you and your bright team. Some general reflections now that I'm back home, miles away. Painting the mural with the children was such a wonderful experience. They worked hard, no complaining about washing up or tidying even very late at night. They had such enthusiasm and good spirit about it that I felt it was just a pleasure to be there with them. It also makes me see all the restrictions we put on being around children and health and safety here in the UK. Some of it is necessary but most of it just makes relationships stiff and unnatural. I'm attempting to get a mural painted on the estate where I live in London, involving the local kids and the nearby school, this is undoubtedly because of my experience at Karm Marg. It will be really interesting to see how it turns out and if it's allowed to happen. On behalf of all at Salaam Baalak Trust, I would like to thank Charty and Sonya for organizing the artreach project in two of our centres – Apna Ghar home for boys in Paharganj and GRP contact point near the New Delhi Railway station. Together with renowned artists, they not only created something beautiful and creative for the kids in our centres but also got sponsorship for funding the entire project at both the places. The children immensely enjoyed working on the mural paintings and are very proud of their work. This hands-on experience also helped in teaching children about life skills such as teamwork, the power of imagination, discipline, creativity, enthusiasm for learning new things, and some recognized their hidden talents. In spite of the constraints in space and resources, the organizers put in their best to ensure that the project was done in a gentle, caring and collaborative manner, bringing out the best in all involved. The Artreach project has made a very positive impact on the children in our centres and we look forward to their continuing support in our work. Returning to India for the third time I was eager to do some voluntary work. India has given a lot to me both in its hospitality and as a source of inspiration for my own work and so I wanted to give something back. I was apprehensive when I started the first project with Artreach. I thought a group of boys with a wide age range of 6-18 would be a hard demographic to manage. I needn't have worried. They were the most wonderful children to work with. Not only did they have bundles of enthusiasm but they were also warm, polite and amazingly helpful not only with the fun jobs but also the boring ones such as washing brushes and clearing up. 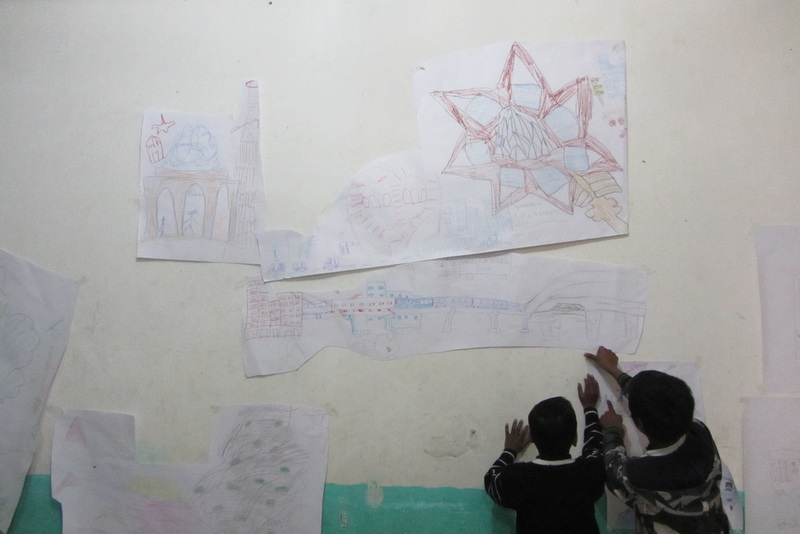 Working with artreach and the Salaam Baalak Trust was a fantastic and rewarding experience that I shall never forget. In a week we transformed a depressing and claustrophobic room into a bright and uplifting space for the children to live in. By the end of the week I was exhausted but so happy, and when artreach contacted me to see if I would be interested to help with a second project I jumped at the chance. 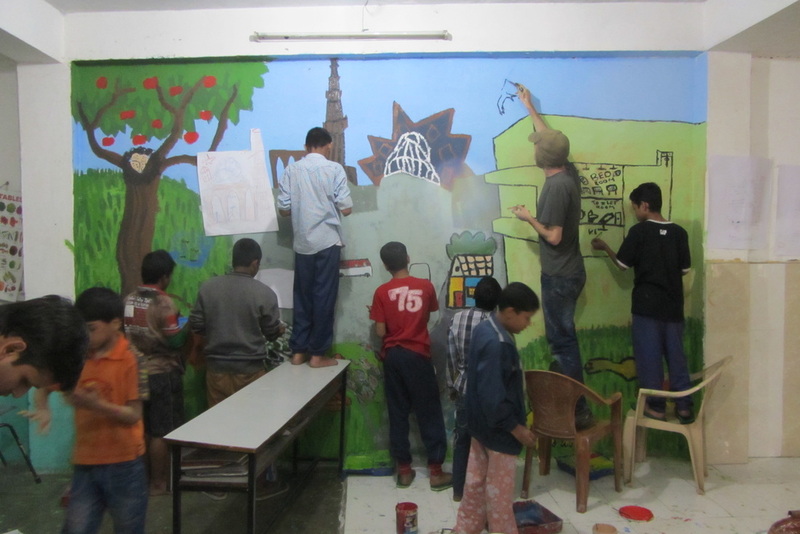 After two months in Delhi, I spent an incredible last week painting with the children at the Salaam Baalak Trust. I had been drawing a lot on the streets of Delhi, but working on the project allowed me to properly interact with the children. I loved watching the boys' different takes on the project, most had an enthusiasm for painting anything and everything in arms reach, but nothing can beat watching the enormous dedication and attention of some, to painting a line of penguins or the detail on a snake. It was great to see the world map and alphabet be used almost immediately and it was also amazing to have black board paint so the boys could continue to draw on some of the wall when the project was over! 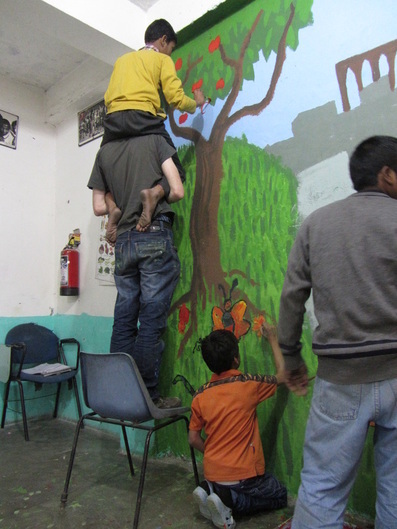 On reflection, the time working on the murals with the lively, energetic, enthusiastic boys were some of the most rewarding, intense moments of my life in Delhi. It was fantastic to watch the transformation of the Contact Point. The walls were dried and freshly plastered prior to painting; so a slightly dank, mouldy oppressive space was transformed into a lighter, colourful room. Although a lot of time has past, 3 years, it still remains a profoundly moving experience. 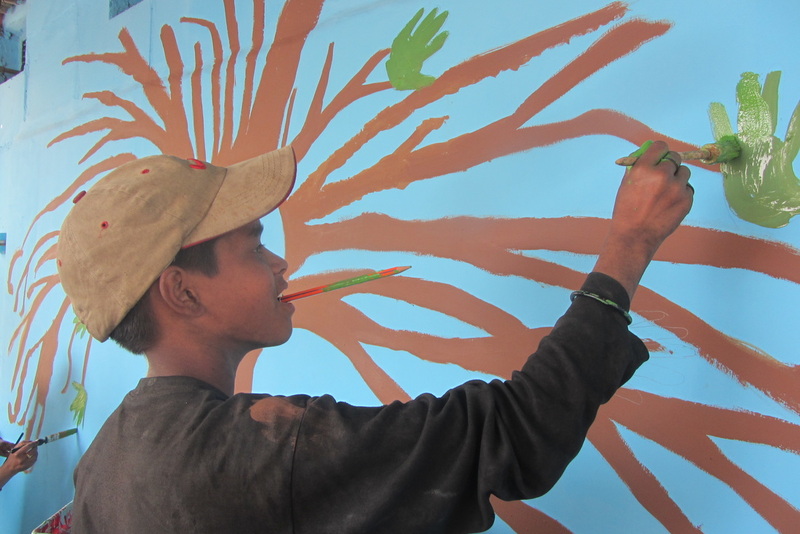 The sheer joy on the boy's faces when a tiger emerged or when their paint roller produced lofty trees and peacock feathers. I remember walking away on the last day of the Salaam Baalak Trust project, a little sad that we'd finished but elated that we had all helped to create a warmer environment. The Rose Home project was such fun! I was so happy to be asked to help again. 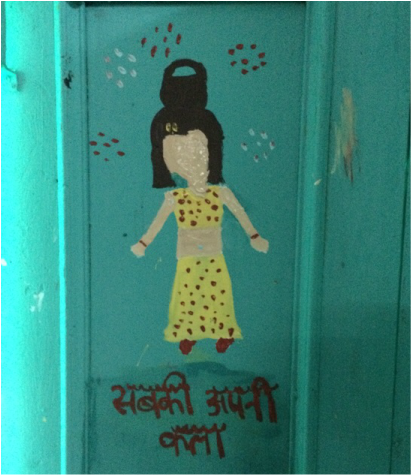 It was a very different experience from the Contact Point, partly because we were painting murals for a home and partly because the interiors were created by and for girls. One thing that impressed me about the children in both SBT projects was their enthusiasm for cleaning brushes and paint trays. There wasn't any complaining and willing volunteers always appeared. I found that refreshing as every part of the process was enjoyed with good humour and a sense of pride. It was a privilege to work with the children and extremely rewarding to see the results of our week's work. 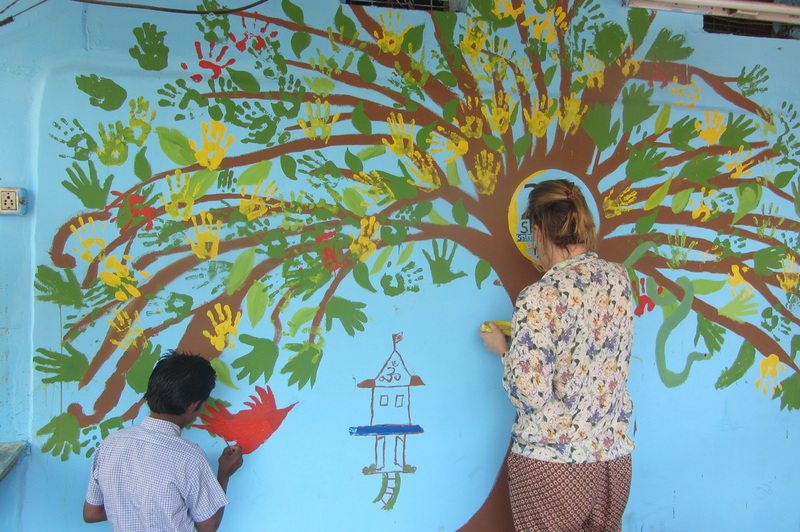 I wanted to work at Jamghat with the kids there to make a mural having spoken to Konrad and Emma about their very positive experience painting at Karm Marg. I felt anxious that I wouldn't be able to manage the mural with the kids ok the first day, and I was worried it wouldn't work. However, the kids were so enthusiastic and hard working and have a great way of looking after and organising each other, that I didn't have any problem and the project went really well. 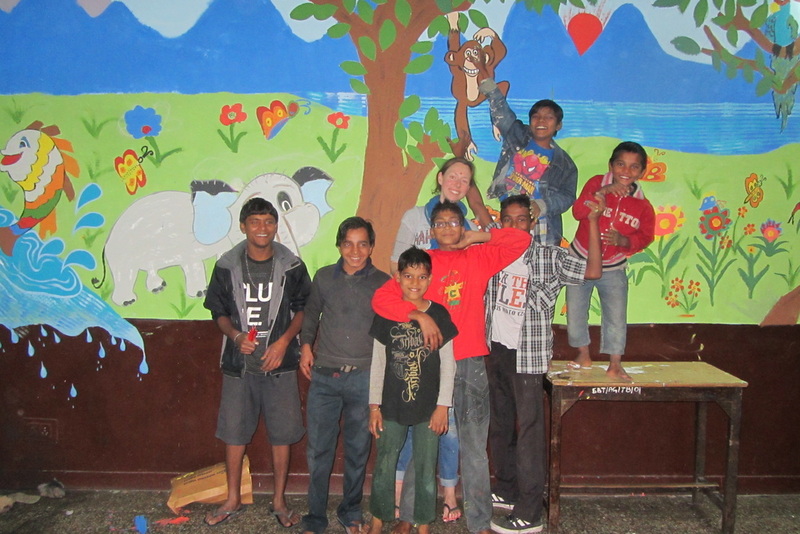 I wanted the mural to be made by the kids as much as by me or more, and that happened, which was brilliant. The kids were very warm and friendly which made the experience something I won't forget, it was brilliant. I especially enjoyed going to the park with them and being taught the game with the ball and stones piled up and chatting to them walking through the neighbourhood. I was very impressed by them, by the way they seem to look out for one another. I felt very very welcome there and would've liked to go again soon after. 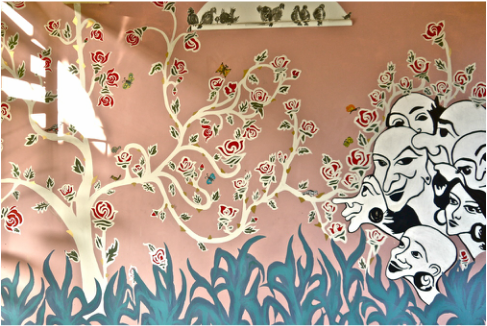 I loved wall painting. That time doing mural with you was a very good time of my life. I felt very good and was very happy with you. I want you to teach me more. Thank you for coming to Jamghat and spending so much time with us. My experience with you was very nice. 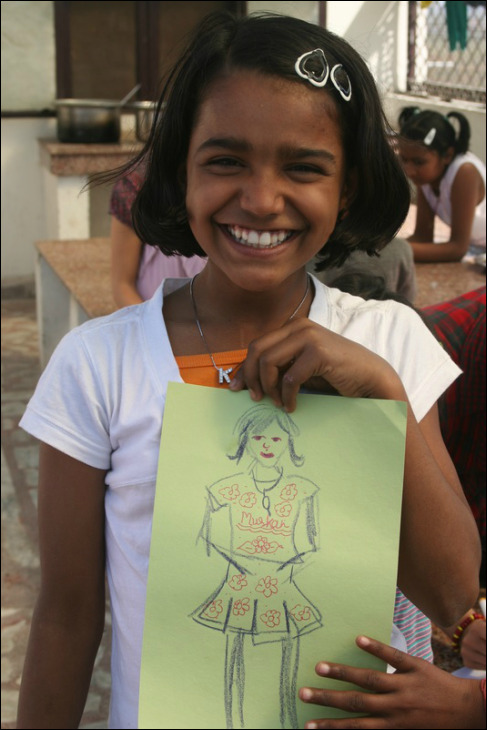 I don’t even know how to draw and paint but you came to Jamghat and did many activities with us. The activities were excellent and I learnt something new about drawing in those two days. I want to say ‘thank you’ for your guidance and for the beautiful mural! I am very happy to do that wall painting with you. Jonny brother is a very good painter. And you taught us how to do it well. I also want you to come to Jamghat again and again. Jonny Bhaiya, you came here and I loved it. We drew many pictures with you. I felt very good doing wall painting. I really want you to come here again. Bhaiya, you paint so well! I also want to learn it and do it like you!